This book is the ultimate guide for learning about the benefits of a vegan lifestyle and it will help you to understand the science behind it and prove that veganism is one of the best decisions you will ever make for yourself. If you have completed one of the Dherbs.com cleanses and are wanting to continue on the path of healthy eating and living, becoming a vegan may just be the route in which you want to take. You will especially be interested in this book if you are needing to lose excess weight, gain more energy, and prevent those family diseases labeled at ‘genetics’. 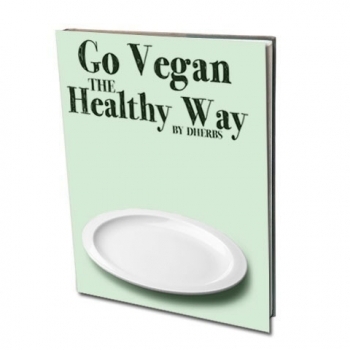 At Dherbs we understand that the hardest part about deciding to go vegan is knowing where to start. This book offers an excellent starting point that gives you a step-by-step guide on choosing veganism and the many benefits your mind, body and overall health will possess. It breaks down what to expect during the early stages of starting a vegan diet as well as helping you to set and reach the goals you have in mind. This book also addresses the B-12 deficiency issue a lot of us have questions or concerns about and breaks down the many different vitamins and nutrients we get from the vegetables and fruits we eat. You will relish in learning that choosing to live vegan is the strongest tool you have against disease and illness. By redesigning your diet, you can completely reverse unfortunate diseases such as heart disease, high blood pressure, diabetes, obesity, etc,. This book is the ultimate guide for learning about the benefits of a vegan lifestyle and it will help you to understand the science behind it and prove that veganism is one of the best decisions you will ever make for yourself. You will not only feel healthier and more alive by following this book, you will feel proud of yourself for making the step towards living a more fulfilling and happy life. This manual will help guide you on your journey to healthy living. *Download will be available after your payment has been confirmed. How to download your E-book. Once you place your order for a E-book, please give us 24 hours to process order. Once your order says SHIPPED. Log-in to the Dherb's Store. Last step click, SAVE AS, then hit SAVE.